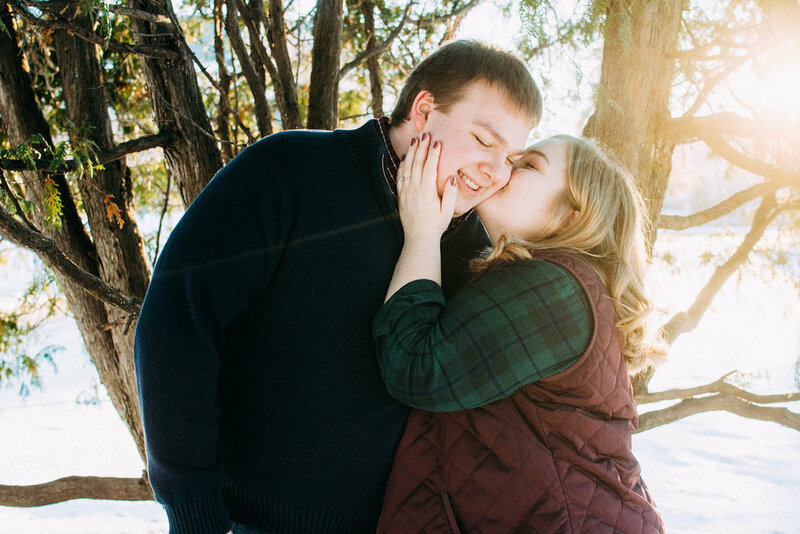 With an odd December, scheduling the “perfect winter engagement portraits” for Hannah & Brandon proved to be more difficult than we anticipated. 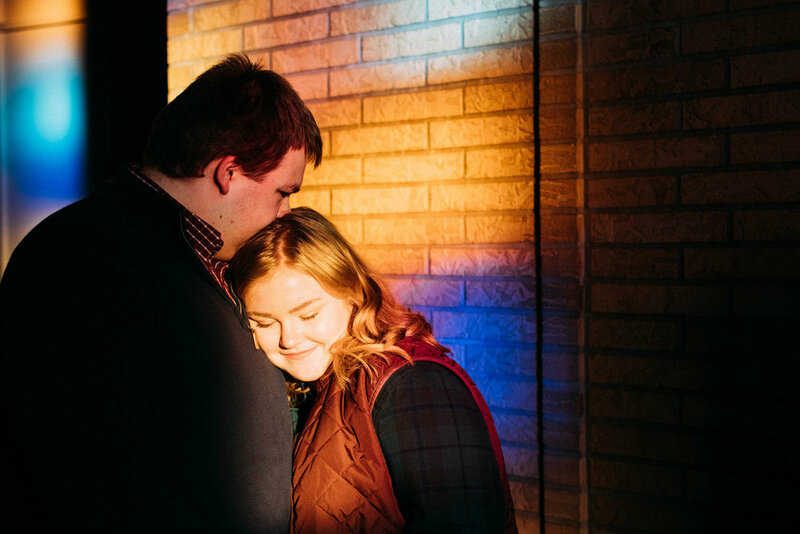 The cheerful couple decided to do two engagement sessions and use their free couple’s session they won last Valentine’s Day to help further capture their love with the anticipation of their upcoming wedding. 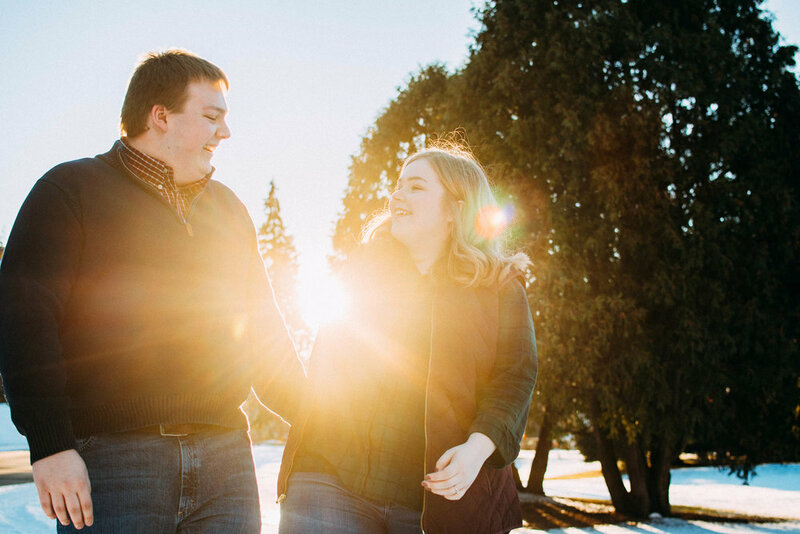 We love the idea of doing engagement sessions in different seasons and settings to help share your love story even better! We started their second session inside of Concordia University’s Graebner Memorial Chapel to stay a little extra warm. We found a little area in the chapel that had beautiful sun shining through the stained glass windows that line the sides of the chapel. Eventually we sucked it up and went outside to the Knoll - the courtyard area of Concordia’s campus. Despite a very minimally snowy December, we found a good balance of both snow and green in the Knoll! We also found a perfect winter sunset. While we don’t always try for sun flares in our photos, it was just too easy in this set! These photos look deceptively warm for Minnesota in December! Concordia’s campus is also filled with beautiful buildings, from rusty bricks to beautiful staircase entryways. Hannah and Brandon - your wedding will be here before you know it! We are looking forward to your beautiful day and are so excited to capture your fun-loving spirits!